SeaWorld's orcas are suffering from psychological distress - and its walruses and dolphins aren't faring much better. Earlier this week Heather Rally, a veterinarian who works with PETA, released the findings of a recent trip she took to SeaWorld San Antonio. Now she's turned her sights on SeaWorld Orlando and the results are just as concerning. 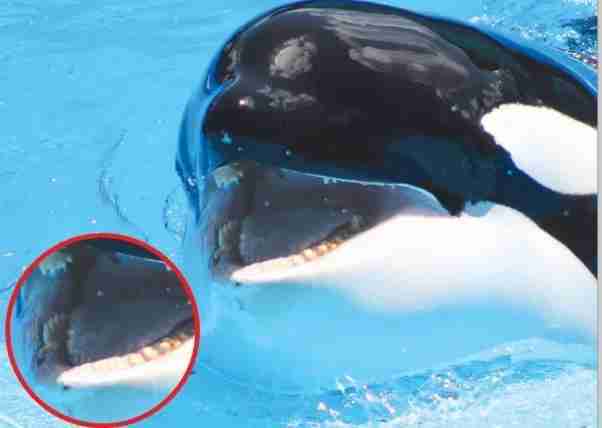 As at SeaWorld San Antonio, Rally saw signs of severe dental trauma and infighting among SeaWorld Orlando's orcas. The whales had teeth that were worn away from chewing on their tanks and had been drilled out by SeaWorld vets. They also bore numerous rake marks on their backs that showed the orcas were fighting in their small, crowded tanks. But Rally also saw something even sadder: signs of severe psychological distress. One orca named Trua, a 9-year-old male, seemed particularly stressed. "He was being held, while I was there, in isolation, completely alone in a back holding tank," Rally told The Dodo. "I don't know the reason why." Devoid of stimulation, Trua resorted to stereotypic behavior, a sign of captive stress where an animal will repeat meaningless patterns of behavior almost compulsively. "He would actually approach the wall, then rub his head against the wall as he went down deeper," Rally said. As she watched, Trua would return to the other side of the tank, then swim back and do it again, repeating these strange laps over and over again. Trua, like many of SeaWorld's orcas, would also float listlessly in the tank - which isn't a natural behavior for wild orcas, who are constantly in motion. "It's very unique to captivity; it's very, very uncommon in the wild," Rally said of the behavior. "It's believed to be the result of chronic stress, boredom and inhibition of natural behaviors that occurs as a result of inadequate living conditions at places like SeaWorld." "The only time you'd see an orca floating in the wild is if they're stranded," she said. "And I wouldn't call that floating." Unfortunately, SeaWorld's orca habitats leave the whales with few other options. 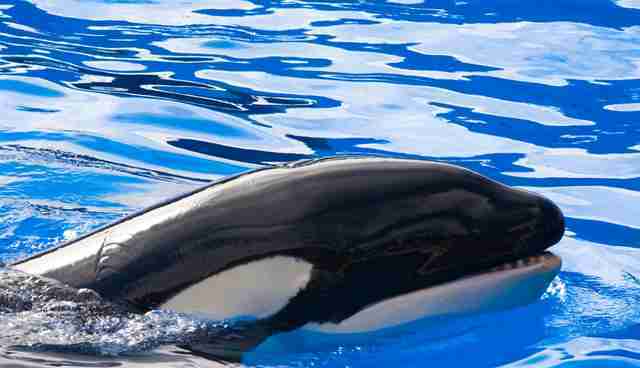 Orcas can easily swim 75 miles per day in the wild; at SeaWorld, they're limited to a few hundred feet. And while orcas have a complex social structure based on lifelong familial bonds, SeaWorld's orcas, like Trua, are often kept in isolation or with other whales they wouldn't interact with in the wild. "They don't have a whole lot else to do other than that," Rally said. It wasn't just the orcas who were suffering. SeaWorld Orlando keeps two adult walruses in an entirely indoor enclosure that, according to Rally, is far too small for their body size. Deprived of sunlight and much enrichment, the walruses, like the orcas, resorted to stereotypic swimming behavior to pass the time, Rally said. During Rally's visit with them, one of the walruses exhibited a "mindless pattern of swimming" where he just swam back and forth in his small enclosure over and over again - with his eyes closed, because he had memorized his tank. "The same exact pattern, over and over again, for the 20 minutes I was there," Rally explained. "The walruses exhibited a variety of behaviors that are abnormal that result from chronic stress and boredom and deprivation." 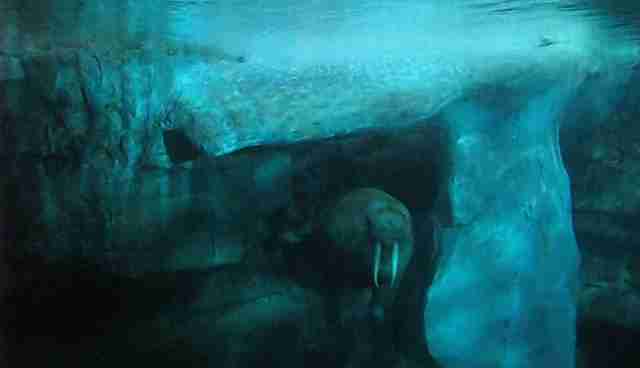 Rally said the walrus' behavior reminded her of Obie, a walrus at SeaWorld San Diego, who was exhibiting repetitive regurgitation behavior when she visited him last year. Obie passed away in June. The dolphins at SeaWorld Orlando aren't faring much better. The park hosts a dolphin lagoon where visitors can interact with the dolphins and some parts are unsupervised, allowing visitors to just place their hands in the water and try to pet the dolphins. 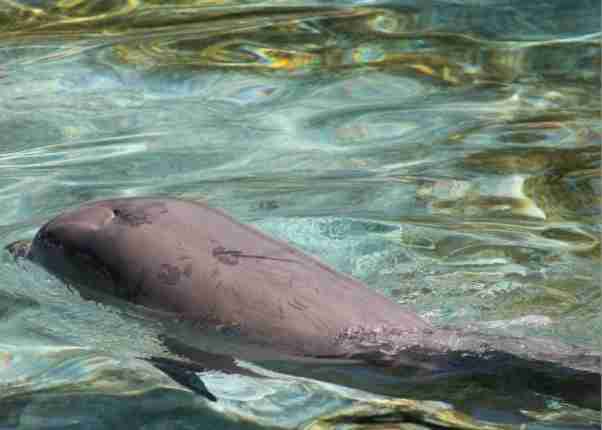 Rally said that a "concerning number" of the dolphins she saw had skin lesions consistent with an infectious disease. She noted some of the dolphins could be suffering from the pox virus, which is somewhat common in dolphins with compromised immune systems or environmental stressors, but other lesions didn't appear to be pox-related. "They were consistent with an infectious origin," she said. "They weren't normal." While part of their skin problems could be due to sun exposure, as they had no shade in their pool, Rally said the lesions were likely due to the strain of captivity. "Not only are these dolphins likely to be stressed and therefore immunocompromised, they're also being exposed to a much larger amount of bacteria [than wild dolphins are] because they're being exposed to people who haven't washed their hands," she said. 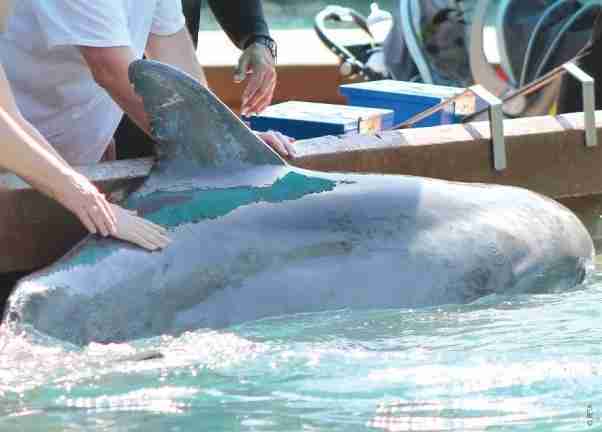 And while lesions can occur in wild dolphins, the frequency of lesions at SeaWorld Orlando was disconcerting. "The vast majority of them had some sort of lesions," she said, as well as rake marks, which indicate infighting between the animals. SeaWorld's no stranger to animal welfare concerns - former trainers have revealed that the company pumps the whales full of drugs to keep them calm, uses food deprivation to control them and separates mothers and infants at an unnaturally young age. The public's taken note of this: SeaWorld's recent quarterly report, released last week, showed an 84 percent drop in net income and an ongoing drop in attendance. Unfortunately, that hasn't yet affected SeaWorld's animals - who are still languishing away in tanks.